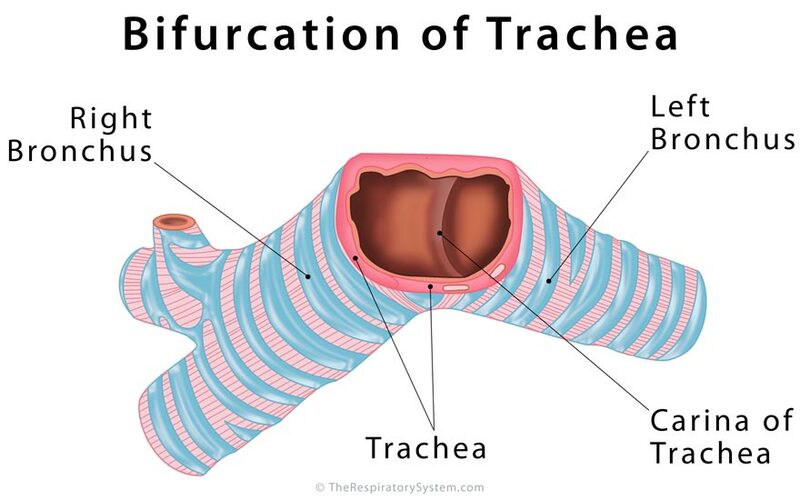 Trachea is the medical name for the windpipe, the largest airway in the respiratory system, about 4-5 inches in length and 1 inch in diameter that extends from the lower end of the larynx or voice box . 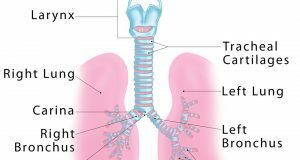 An integral part of the human airway, the trachea, bronchi, bronchioles, and alveoli together make up the lower respiratory tract [2, 3]. Beginning at the neck’s base (just below the voice box) the trachea is located in the thoracic or chest cavity, in front of the esophagus, running along the midline of the human body  down to the back of the sternum (breastbone). It divides into the left and right bronchus, connected to the left and right lung respectively . Respiratory Mucosa: The innermost layer of the trachea, consisting of ciliated pseudostratified columnar epithelium and lamina propria (a thin layer of connective tissue), is covered with a sticky mucus coating produced by the goblet cells present in the region . Submucosa Layer: The mucosa is followed by the submucosa layer, primarily composed of areolar tissue . The proteins elastin, collagen, and reticular fibers help to maintain the overall elasticity of the tracheal wall, while the nerves and blood vessels of the areolar tissue provide for the different layers. 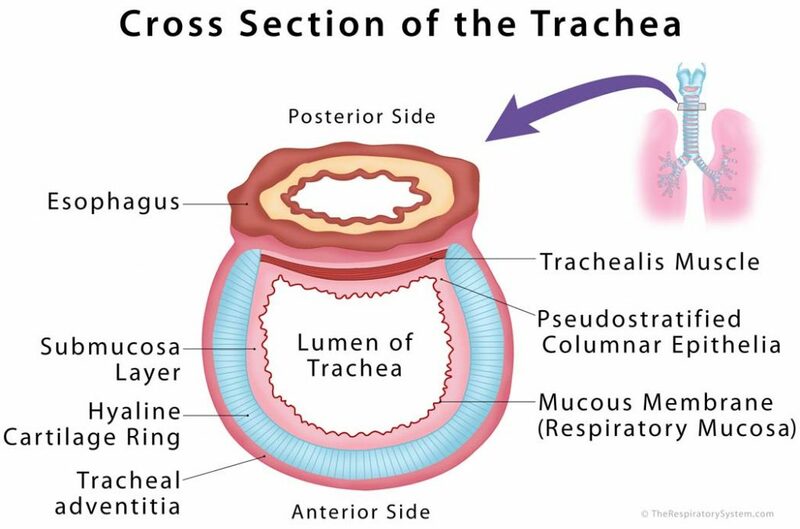 Tracheal adventitia: Also made up of areolar tissue, this is the external layer of the trachea that keeps it loosely attached to the esophagus and other surrounding soft tissues . 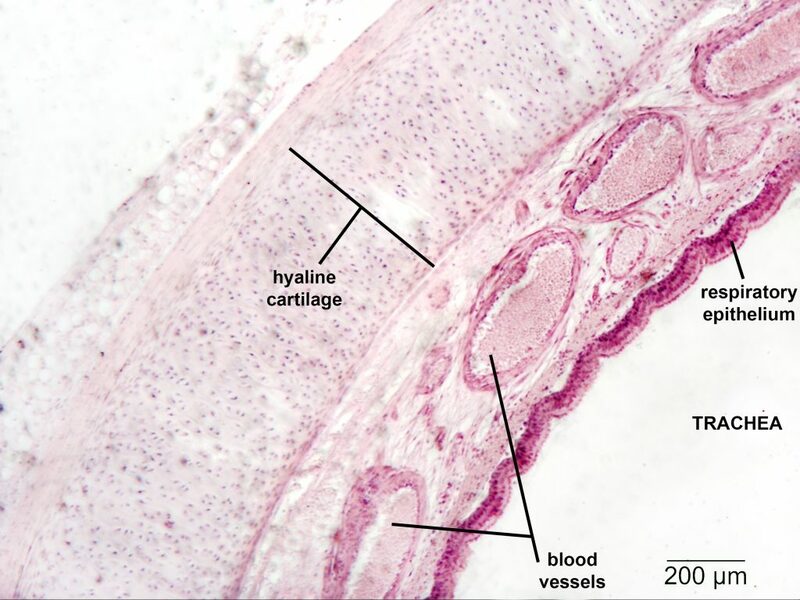 Sixteen to twenty c-shaped hyaline cartilage rings are arranged along the submucosa layer of the tracheal tube, separated by narrow membranous spaces, with their number varying depending on individuals and their age . Each tracheal ring is around 1-2 mm thick and 4-5 mm deep, being open at the posterior side of the trachea, where it is closest to the esophagus, the passage between the throat and stomach . The firmness of the cartilages helps to keep the trachea from collapsing , while their flexibility allows it to move freely during breathing. The smooth trachealis muscle is located longitudinally between the open ends of the c-shaped cartilages, connecting them with each other . Carina is the ridge just before the bifurcation of trachea, the point where the trachea divides into the left and right main bronchi [9, 10]. Functions in Inhalation and Exhalation: The windpipe, being the link that connects the larynx to the primary bronchi, plays an active part in letting the air travel in and out of the lungs . The inhaled air passes from the nasal and oral cavities, through the pharynx, larynx, trachea, and bronchi into the lungs. Similarly, during exhalation, the carbon dioxide-rich air travel back from the lungs into the trachea, larynx, and pharynx via the bronchi, to be expelled through the nasal and oral cavities . With each inhalation, the trachea expands slightly in length and width, returning to its normal state with each exhalation. The smooth muscle fibers between the tracheal ring-ends help the trachea in adjusting its diameter every time . In Purifying the Inhaled Air: The inner walls of the windpipe are covered in tiny hair-like structures called cilia and lined with a mucus layer . As the air enters, the sticky mucus plays a crucial role in trapping any dust particles and foreign objects, leaving only clean air to pass into the lungs . At the same time, the cilia beat from back to front continuously with the purpose of carrying the mucus away from the bronchi and towards the larynx, where it is either excreted through coughing and sneezing or swallowed to be digested along with the impurities . Function in the Digestive System: The flexible tracheal rings allow the trachea to compress, so the esophagus gets enough space to expand during swallowing . In Cough Reflex: When you cough, the trachealis muscle contracts to narrow down the tracheal lumen to make the air flow faster through the trachea on its way out. As a result, your coughs are more forceful, helping in removing mucus and any dust particles . Tracheal stenosis (narrowing of the trachea): Abnormal narrowing of the lumen of the trachea, leading to breathing difficulty, coughing, high pitched noise from the lungs during breathing, along with frequent upper respiratory infections . It may be present at birth, but more commonly occurs due to prolonged intubation (breathing assistance with a tube inserted into the trachea) for some medical procedure, or a surgical tracheostomy . Certain medical procedures can help to reopen the airways. Tracheoesophageal fistula: A congenital deformity where the trachea has an abnormal connection with the esophagus at one or more points. It can cause serious swallowing problems as the swallowed food and liquid might enter the lungs through the trachea-esophageal connections, leading to various conditions . Airway obstruction: Can occur from something as simple as some food getting stuck in the windpipe, while more serious causes may include food allergies and infections. Immediate medical attention is necessary, or the obstruction may turn life-threatening . Tracheal cancer: Often linked with smoking, its exact causes are still not known. Symptoms often include wheezing, dry coughing, breathing difficulty, hoarseness of voice, coughing up blood, recurring chest infections, and fever . Saber-sheath trachea: A diagnostic finding that often helps in detecting health conditions like chronic obstructive pulmonary disease, a saber sheath trachea refers to abnormal narrowing of the windpipe from the upper end, while the lower end may widen gradually, giving it a saber-sheath-like appearance . Tracheal rupture: A tear or hole in the tracheal pipe, it is usually caused by some external trauma, like a car accident, or some sports injury, but may also occur due to some abnormal growth on the tracheal walls. Surgical reconstruction is required in most cases, while infected ruptures may also need antibiotic treatment. 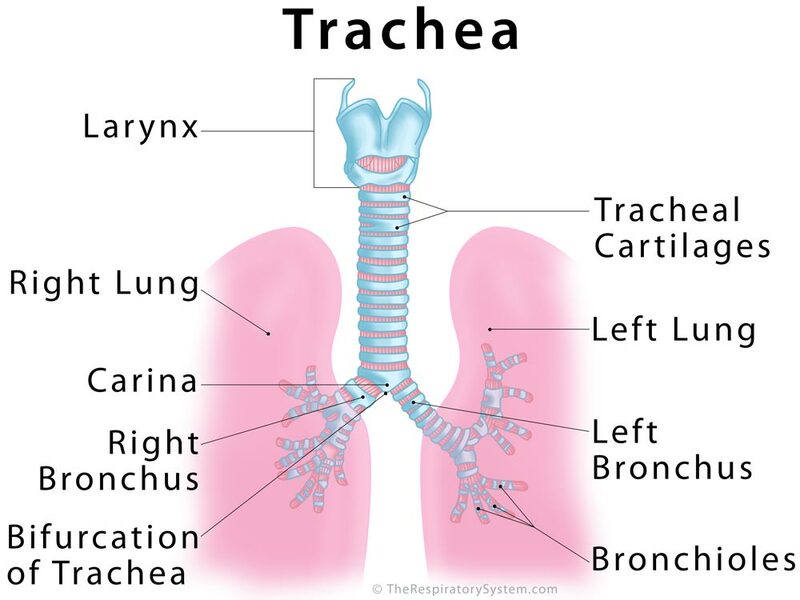 Tracheomalacia: Often present at birth, tracheomalacia refers to a weak or floppy trachea that collapses after each exhalation, making it difficult to inhale again. Surgical correction at an early age usually allows the affected children live a normal life . Bacterial Tracheitis: A bacterial infection that often causes swelling, inflammation, and soreness of the trachea, it is more common among children, often occurring after an upper respiratory tract infection. Symptoms include deep coughing (usually painless ), wheezing, fever, trouble breathing, and a blue tint to the skin. Treatment is done with antibacterial medications while intubation may be necessary in some severe cases . Any abnormality in its appearance or location, like an enlarged, shifted or deviated trachea may indicate various life-threatening conditions . Studies and experiments are underway to find out if tracheal transplant may be a possible treatment option for people with a severely damaged or malfunctioning windpipe .